1. Mariano Rodriguez:Hi Rafa. I am a doctor and do not believe that viral infections have had a sweat over a few weeks ago now. I attribute it to the shirt, not enough sweat to evaporate and are more exposed parts. A player may refuse to wear the shirt that requires a signature? If you are the more quality tennis circut. Thanks. Nadal:I think it is the case. Anyway, I try everything before, months before and analyze all the conditions we're going to find. I think it's exasperating this. 2. July Tinto (Cadiz)Hi Rafa, my boy.Congratulations on your great career What do you attribute the overwhelming dominance of European tennis today? In the men of Australia is only one Canadian, who is also of Balkan origin, and two Chinese fememnino. All others are Europeans ... Very strong, no? Nadal:Tennis in Europe has always had a great tradition, not uncommon. The strange thing is that not many American players, Australians or Swedes, who are Europeans, with great tennis tradition, but now they have many players. 3. 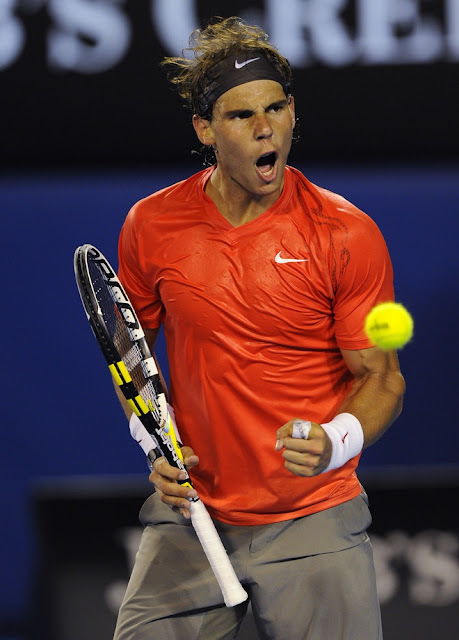 Javier AlicanteHi Rafa, have you added the star of the U.S. Open your racketeers? What color is it? If you win the Masters, did you also put a star? 4. Mary Matheson:Rafa what steps you take to recover after a game where you have lost so much weight as before Tomic? 5. Lucia Giron (Córdoba)Hi, Rafa. Federer will win on something other than the number of Grand Slam titles. He has already doubly father but you still do not decide, even though you have a long term partner. When will an Nadalin? Thank you very much and kiss. Nadal:I do not know, we should ask him. Will have their reasons, I know. And if they knew it also corresponds to speak of a thing. I am no one to talk about these things. 7. Rodolfo Peris:What do you consider more complicated, winning four 'big' in the same year, as Laver did in 1969, or on four different surfaces, as you can do it this week. A greeting.Nadal:Both are difficult, of course. Just look at the people who have succeeded. 8. Ed Marmolejos:At the U.S. Open was said that the shape of your service had changed for the better, faster, better put, that prevented you wear. We were senación that it was. Do you really believe your service is adapted to this type of track? In your opinion, what is the importance of service for the upcoming matches? Nadal:Yes, I got pretty good. I wish I could return to retrieve the service. Yesterday I did not take too well. Hopefully tomorrow kick better. 9. Luis Gomez de la Barcena:Hi Rafa. If you win the toss to start the game, what do you prefer to choose and why? Do you choose always the same and depends on the rival, sun, etc? Nadal:I prefer to subtract, I always do well. Is to try to break in the first game and have the advantage to get more comfortable. 10. Antonio Corzo:Hi Rafa. Seeing these new players and Tomic, Dimitrov, Raonic or Berankis is that their evolution is much slower than yours. Do you think this may be because you forget the junior circuit and started to desfogarte before in Futures and Challengers? Thanks and by the fourth row. Nadal:No, it has nothing to do. I was lucky to not have to go much lower circuits and went quickly to the professional. Each player is different and not be forced. You can use this link & send Rafa a question in Spanish in the sidebar where it says "Send Rafa a Question"